Eating or drinking grapefruit may help people who are obese to lose weight, a study suggests. Researchers in the United States say adding grapefruit to people's diet may also protect them from diabetes. The findings are based on a study of 100 obese people, who ate or drank grapefruit for 12 weeks. The researchers are now planning a much larger study to see if the results are the same, according to a report in Chemistry and Industry magazine. Ken Fujioka and colleagues at the Scripps Clinic in San Diego California enrolled 100 obese patients with an average weight of 218 pounds in the study. One group of volunteers ate half a grapefruit before each meal three times a day, while another drank a glass of grapefruit juice before every meal. A third did not include grapefruit in their meals. After 12 weeks, those eating grapefruit had lost an average of 3.6 pounds, and some shed as much as 10 pounds. 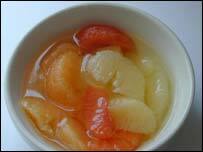 The participants drinking grapefruit juice lost an average of 3.3 pounds. But those in the control group who consumed no grapefruit only lost an average of 0.5 pounds. The researchers said the weight loss was probably linked to lowered levels of insulin, which was born out by measurements of glucose levels. Insulin is used to metabolise sugar. The more efficiently sugar is metabolised, the less likely it is to be stored as fat in the body. Lowering insulin levels also makes people feel less hungry. High levels of the hormone stimulate the brain's hypothalamus, causing feelings of hunger. They also stimulate the liver to manufacture fat that can constrict arteries, leading to heart attacks and strokes. "Grapefruit is already known to affect the metabolism of some drugs," said Chemistry and Industry. "It improves the efficiency of some common oral medications, such as those taken for blood pressure, sedatives, and some immunosuppressant." Emma Bunn, diabetes care advisor at the charity Diabetes UK, said: "If grapefruit does significantly lower insulin levels this could be a potentially exciting discovery. "We know weight loss reduces the body's resistance to insulin and therefore improves diabetes control, so weight management is important in prevention and treatment of diabetes. "We will be following any further research in this area closely to establish if grapefruit could provide genuine benefits."